Hyper allows to specifically define authorizations to each of its users. There is a very high importance for the authorizations definitions of the employees, and therefore the system administrator should pay much attention to define the authorizations according to the organizations policy and the employee's job definition. At the top of this tab, the definition fields are used for Hyper's functions and tools, as described below. Email account - Define the Email account of the user. Extended Authorization Rules - Advanced authorizations for other users Calendar and Email Box. These fields are used for the user's definitions in Hyper. The user authorizations should be defined according to the user's job definition and the organization's policy. The following definitions fields will describe and limit the user's activity in Hyper. These definitions can be modified at any time. Hyper User Name This name will represent the user for the access to the system and in each of the activities and functions of Hyper. After creating this user, its name can be changed according to authorizations, by using the Rename Hyper Username button, at the bottom of this tab. Magnetic Strip ID (Password) The magnetic card is used for identifying the employee at the cashier desk. Hyper Authorization According to the selected authorization group, buttons, tabs, reports and filters will be available / hidden for the user. Each employee can be related to one authorization group only. For further information about authorization groups, press here. Suspended from Login Use this option to suspend a user from logging in the system. Allow to Login only from WAN IP Addresses In order to allow the user to log in only from defined IP addresses, fill in the addresses in this field. Leave this field empty to allow the user to log in from any IP address. Allow to Login only on working hours Select "YES" to allow the user to log in only during the working hours, as defined in the Employment Details tab. Terminate Hyper after not working for Use this field to define the timing for terminating Hyper after not working. Select "Do Not Terminate" to keep Hyper logged in. Visible in Users Tree Define whether to make this user available to be selected from the organization's users tree, in Hyper modules, tools and functions. Enabled to Copy-Paste data from Read-Only tables This authorization allows to copy information from the system. Please Note - when giving this authorization, please take into consideration whether the employee has an access to classified information. Therefore, this authorization should be given according to the organizations policy. Enabled to Modify System Fundamentals This authorization allows the user to modify the system fundamentals of Hyper. This authorization should be given to users that will need to modify the system fundamentals, according to the organizations policy. No - This definition will not allow the user to modify the system fundamentals. 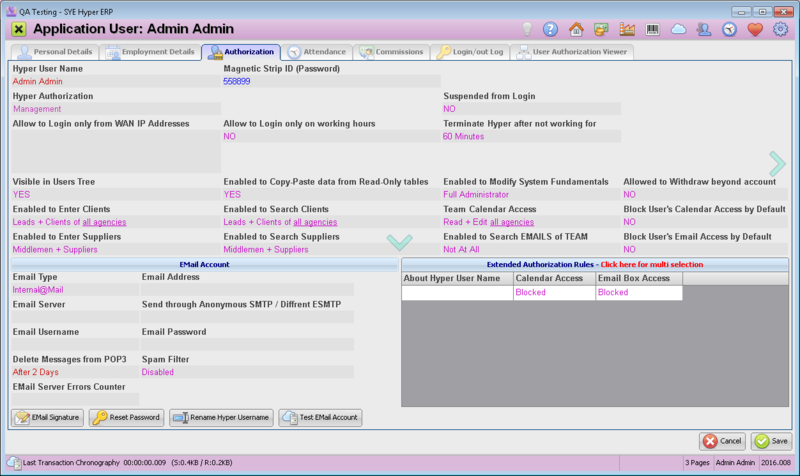 Full Administrator - This option allows the user to modify all of the definitions in the System Fundamentals. CRM Administrator - The user can modify only the definitions of the clients in the system fundamentals. This authorization does not allow to add and define information fields and DB, does not allow to modify Bookkeeping definitions as well as any system fundamentals definitions of the system and the organization. Allowed to Withdraw beyond account Balance Define whether to allow this user to withdraw from accounts, beyond the accounts balance (allow negative balance). Please note - This authorization should be given to authorized users and managers only, according to the organization policy! Enabled to Enter / Search Clients These fields are used for defining the user authorizations for the organization's clients. Not at all - The user can not search for clients or open clients cards. Leads + Clients of all agencies - The user can search / open leads and clients from of agencies. Leads + Clients of his agencies - The user can search / open leads and clients from of his agency only. Leads of all agencies - The user can search / open leads from all agencies. Clients of all agencies - The user can search / open clients from all agencies. Leads of his agencies - The user can search / open leads from his agency only. Clients of his agencies - The user can search / open clients from his agency only. Assigned Leads + Clients of all agencies - The user can search / open clients of all agencies but can search / open only assigned leads. Assigned Leads + Clients of his agencies - The user can search / open clients of his agency and can search / open only assigned leads. Assigned Leads + Assigned Clients - The user can search / open only assigned leads and clients. Assigned Leads - The user can search / open only assigned leads. Please note - The user can have different authorizations in the enter / search fields. Enabled to Enter / Search Suppliers These fields are used for defining the user authorizations for the organization's clients. Not at all - The user can not search for suppliers or open suppliers cards. Middlemen + Suppliers - The user can search / open all of the suppliers and middlemen cards. Only Middlemen - The user can search / open middlemen only. Only Suppliers - The user can search / open suppliers only. Assigned Middlemen + Assigned Suppliers - The user can search / open . Only Middlemen of his agency - The user can enter / search middlemen of his agency. Only Suppliers of his agency - The user can enter / search suppliers of his agency. Middlemen + Suppliers of his agency - The user can enter / search middlemen and suppliers of his agency only. Team Calendar Access Define the authorization of this user, to access other users calendar. Not At All - No access to other users calendars. Read + Edit all agencies - The user can read and edit the calendar of all agencies. Read all agencies + Edit his agency - The user can read the calendar of all agencies and can edit only the calendar of his agency. Read + Edit his agency - The user can read and edit only his agency. Read all agencies - The user can read the calendar of all agencies. Read his agency - The user can read the calendar of his agency only. Read + Edit his department - The user can read and edit the calendar of his department only. Read all agencies + Edit his department - The user can read the calendar of all agencies and can edit the calendar of his department. Read his department - The user can read the calendar of his department only. Please note This definition can be modified in the Extended Authorization Rules. Block User's Calendar Access by Default Use this option to prevent the user from opening his own calendar. This option is useful when the employee is about to finish his work and the management wants to prevent him from any access to the calendar. Enable to search EMAILS of Team Define the authorization for the user to search and view the Email messages of the team. Not At All - The user can not view others Email messages. Read emails of all agencies - The user can view the Email messages of all agencies. Read email of his agency - The user can view the Email messages of his agency only. Read emails of his department - The user can view the Email messages of his department only. Please note - This definition can be modified in the Extended Authorization Rules. Block User's Email access by Default Use this option to prevent the user from opening his own calendar. This option is useful when the employee is about to finish his work and the management wants to prevent him from any access to the mail boxes. Internal@mail - Internal Mail only. The user can send and receive messages only from the organization's users of Hyper. This male box is automatically created for every user of Hyper and can be found in the "Colleagues (Users)" list of the "Add Recipients" window. For these users, there is no need to define any other fields except of this one. If there is a defined Public Mail Box for this user, messages can be sent and received according to its definition. POP3/ESMTP - Define this mailbox to send and receive messages. POP3 Only - This mailbox can only receive messages. ESMTP Only - This mailbox can only send messages. Email Address The email address for sending and receiving messages. Email Server If the same server sends and receives the messages, fill in its name (the domain name is the URL of the server). If the server that sends the messages is different than the receiving server, use this field to define receiving server (POP3). In the "end through Anonymous SMTP / Different ESMTP" field, define the sending server (SMTP). Send through Anonymous SMTP / Different ESMTP Use this field to define the sending server of the messages (SMTP), if there is a different receiving server. EMail Username The username for the automation, for using the mail box that was defined in the "Email Address" field. EMail Password The password for using the mail box. Delete Messages from POP3 Hyper receives the Email messages from the mail server and stores it separately. This field defines the timing for deleting the messages from the server (not from Hyper). If you prefer not to delete the messages, contact our support team. Spam Filter This field defines whether the system uses the spam filter. The system will accept messages from email addresses of Hyper cards (clients / suppliers / projects), personal contacts and Email addresses that were approved by the user. Hyper compares the sender's Email address to the database and if there is no match, the message will be marked as SPAM. EMail server Errors Counter This is a counter of the Email server errors. For other common Email services, contact the SYE support team to ask for a preset. Use this table to define individual authorizations settings for Calendars and Email boxes. This table is usually used for Calendars and Email Boxes of managers, or in order to allow an exceptional access to Emails and calendars which are blocked for other users. About Hyper User Name Click in this field to open the Select Users Dialog. Select the required user for the extended authorization rule. Please note - for multi selection of users, click the title of the table (marked in red). Blocked - Block any access to this user's calendar. Read Only - Allow to view the calendar of the selected user. Read + Edit - Allow to view and edit the selected user's calendar. Blocked - Block any access to this user's Email Box. Read Only - Allow to view the Email Box of the selected user. In this window, the user can create or edit the Email signature. For further information, click here. Use this button to define a new password for this user. In order to modify the username, the system scans all of its modules and updates the new username. Fill in the new required username in the "Hyper User Name" field. Please note - this procedure may take few minutes, since the system scans and updates all of its modules and tables. This option was designed for organization with email system that uses Hyper's server. After creating the Email account in the user's card and in the Email server, this option will test the email account and display the results of the receiving and sending messages by using this mail box. For further information about this options, click here. Message Subject - If the original message does not have any subject, the subject will be taken from the winmail.dat file. Message Body - If the original messages does not contain any content, the message body will be taken from the winmail.dat file. If the original message contains more than 20 chars, the system will merge the two messages as follows: the original message will be displayed, followed by the content from the winmail file. Attached files - Attached files to the winmail.dat file, will be displayed at the bottom of the message. Only the decoded Email messages of this format are saved in Hyper, after being merged, as described above. The details of the sender and the addressee are taken from the original message and not from the winmail.dat file. The encoding of Hyper is always in the following standards: UTF8, Base64.